This park is part of Proposition Z, which was passed in 2012. A ground breaking ceremony marked the beginning of construction on the McKinley Elementary School joint-use park. A new park is now one step closer to being completed. 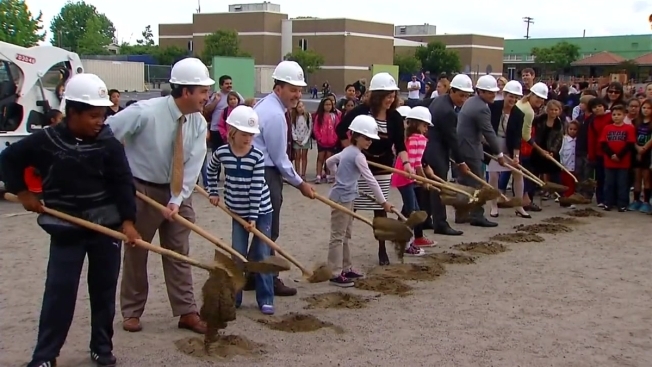 Ground broke on the McKinley Elementary School joint-use park Monday morning several years after San Diego Unified School District’s (SDUSD) $2.8-million Proposition Z, which this project is a part of, was approved in 2012. The 1.34-acre park is located on the south side of McKinley Elementary School campus on Felton Street and will have natural grass turf, new trees, a baseball backstop, a concrete play area, a decomposed granite running path as well as security gates and fencing. The project is expected to be completed this fall and SDUSD hopes projects like this will enhance neighborhood schools. While the district is developing the park, the city of San Diego will be responsible for maintaining the park as part of their Play All Day initiative. To learn more about Proposition Z, click here.